In March 2017, the 20th Maggie’s Centre was opened in the grounds of Forth Valley Royal Hospital in Falkirk. 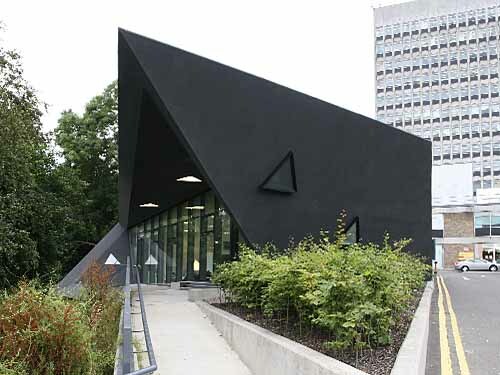 Designed by architects Garbers & James, it is expected to receive 3000 visits in the first year. Maggie’s provides free practical, emotional and social support to people with cancer and their family and friends, following the ideas about cancer care originally laid out by Maggie Keswick Jencks and co-founded by her husband Charles, who is a landscape architect. Among Maggie’s beliefs about cancer treatment was the importance of environment to a person dealing with cancer. She talked about the need for “thoughtful lighting, a view out to trees, birds and sky,” and the opportunity “to relax and talk away from home cares”. She talked about the need for a welcoming, reassuring space, as well as a place for privacy, where someone can take in information at their own pace. This is what Maggie’s centres today aspire to. 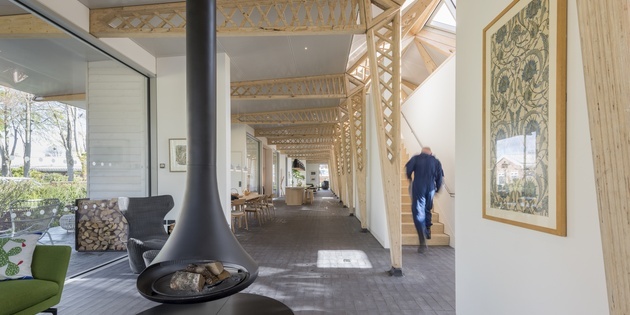 A number of high profile architects have designed Maggie’s Centres across the UK – from the late Zaha Hadid to Frank Gehry, Richard Rogers and Rem Koolhaas. Drawing on research which considers the significant impact that environment can have on wellbeing, Maggie’s Centres are designed to be warm and communal, while at the same time being stimulating and inspiring. The interiors are comfortable and home-like. Landscape designers and architects are encouraged to work closely together from the beginning of a project as the interplay between outside and inside space, the built and the “natural” environment, is seen as an important one. Each of the centres incorporates an open kitchenette where patients can gather for a cup of tea, airy sitting rooms with access to gardens and other landscape features, and bountiful views. There are also private rooms for one-on-one consultations; here Maggie’s staff can advise patients on a range of issues relating to their condition, whether that is dietary planning, discussing treatment options (in a non-clinical setting) or delivering classes such as yoga. Maggie’s Centres are also about offering spaces to people to help improve their mental wellbeing. As well as quiet tranquil spaces for reflection and meditation, there are also central areas, focused on encouraging the creation of a community between the people who use the centre. 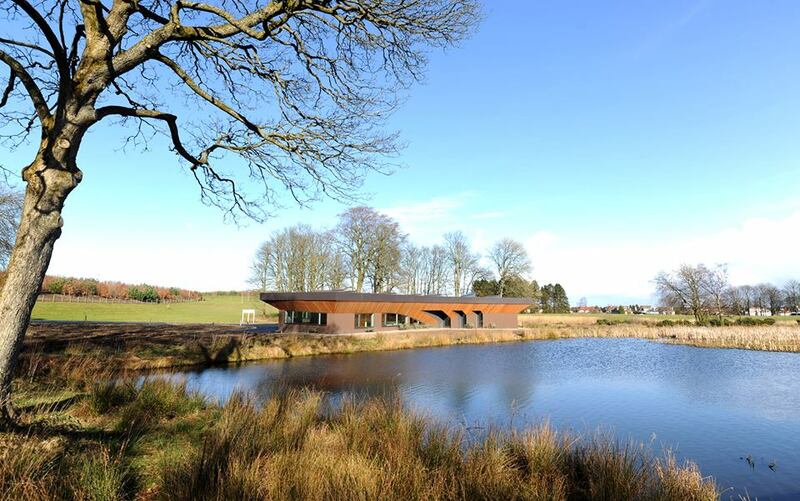 Wide-open spaces, high ceilings and large windows, with lots of opportunities to view the outside landscaping and allow natural light to enter are a key feature of many of the Maggie’s Centres. The locations also try as far as possible to provide a space free from noise and air pollution, while remaining close enough to oncology treatment centres to provide a localised base for the entire treatment plan of patients. Fresh air, low levels of noise and exposure to sunlight and the natural environment, as well as designs that provide spaces that promote communal interaction to reduce feelings of isolation and loneliness, have all been shown to improve mental as well as physical wellbeing. In this way, the physical attributes and design of the Maggie’s buildings are helping to promote mental as well as physical wellbeing of patients and supplement the care being given by the cancer treatment centres located nearby. In 2017 Maggie’s Manchester was shortlisted for the Architects’ Journal Building of the Year award. And many of the individual centres have won regional design awards for their innovative use of space and incorporation of the natural environment into their designs. A Maggie’s garden was also featured at the 2017 Chelsea Flower show, highlighting the importance of environment, and the role of the natural environment in rehabilitation and promoting wellness among those who are ill.
How design and landscape can aid and empower patients is central to Maggie’s Centres. They are a prime example of how people can be encouraged to live and feel well through the design of buildings and the integration of the surrounding natural environment. These environments are the result of a complex set of natural and manmade factors, which interact with one another to promote a sense of wellness, strength and rehabilitation. They demonstrate how the built environment can contribute to a holistic package of care – care for the whole person, not just their medical condition. Other health and social care providers can learn from them in terms of supporting the wellbeing of patients, carers and their families. You can find out more about Maggie’s Centres though their website. Keep up to date with what is interesting our research officers on Twitter. Read more about innovative building design in our other blog articles.